As electronic packaging becomes more compact and processing power continues to increase, engineers are looking for alternatives that provide more efficient thermal transfer in a smaller space. Forged heat sinks are becoming a popular alternative in meeting today's thermal challenges due to the unique characteristics that are discussed in this article. Key characteristics of each method are discussed below. Heat sinks can also be machined from a solid piece of metal but are not included in this analysis because the cycle time and associated cost are generally not economically viable for production volumes. Machining is most appropriate for prototypes, short run and low volume production; and the performance characteristics will be similar to a forged heat sink. Diecasting is an effective method for forming complex shapes; however as the molten metal cools in the die, it inherently expands creating voids. The porous interior weakens the structure, inhibits thermal performance and is difficult to machine. Extruding is most effective for creating linear shapes. The metal is heated to allow the material to be formed by the die and the grain structure cannot be controlled evenly. These factors combine to reduce thermal performance. Forging is the most effective method to form complex shapes and also offers unique thermal advantages. Forging is a cold process. The part is formed under high pressure which controls the grain structure and results in improved thermal performance. The chart below compares the thermal performance of three identical shapes; one formed by die casting, one formed by extruding and one formed by forging. The data indicates that the forged heat sink has superior thermal conductivity when compared to the die cast and extruded equivalents. 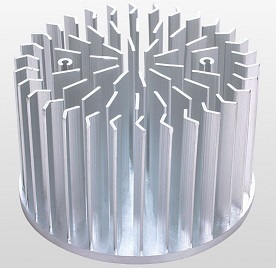 The cold forging process results in a heat sink that yields a 14% improvement over the extruded counterpart and a 62% improvement over the die cast counterpart. 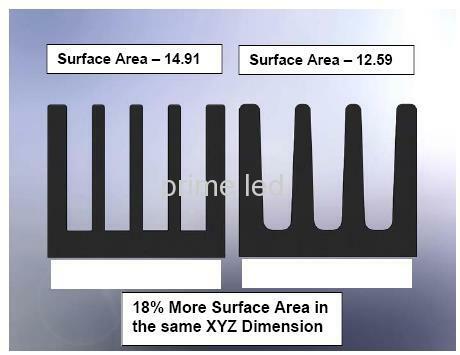 An increase to the surface area of a heat sink will almost always result in improved thermal performance. This may not be true if fins are so close together that they inhibit air flow. Extruded fins must be tapered so that the material will pass through the tool without breaking. The number of fins in an extrusion will always be limited by the width at the base and the aspect ratio of the fins. These restrictions inherently limit the surface area. Forged fins can be made almost perfectly straight allowing for more fins per square inch. The fins can also be formed into an elliptical shape. The resulting increase in surface area can also be an important factor in improving thermal performance. The pictures below illustrate this concept. The forged heat sink pictured above increases the surface area by 18% without increasing size or weight. The result is increased thermal performance. time and the cost of the finished part. The forging process has few limitations to forming shapes and complex fin designs. A forged part is formed in two dimensions within the tool to create complex shapes without the need for secondary operations. Holes, chamfers, pins, elliptical fins, steps, etc. are created in the tool in a single operation. In the part pictured above, the copper spreader plate is inserted with the block of aluminum into the tool. As pressure is applied the softer aluminum forms around the copper creating a mechanically fused, void free bond that offers improved thermal spreading resulting in improved thermal performance. The forged heat sinks pictured below provide additional illustrations of the unique shapes and fin designs that can be achieved in the forge tool in a single operation. increasing the size of the heat sink are unique advantages. These factors are especially critical when space is limited and/or weight reduction is critical to the product. Precision forging can also produce complex shapes such as elliptical fins,taggered fins, round pin arrays, steps, etc. within the tool. 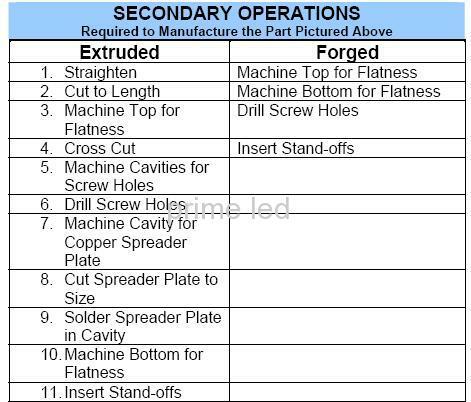 These features cannot be achieved in an extruded or die cast part. Finally, precision forged heat sinks can often be manufactured at a lower cost because most operations can be performed in the tool and secondary operations are reduced. Previous:	How to Choose Right Color Temp Next: What's COB LED?